Anticipations and excitement for OnePlus 5 smartphone are no less than the upcoming iPhone or S8 Note. Leaks and specification reveals from unofficial sources are quite common few weeks before the big release. Same is true for the OnePlus 5 as well. Remember those blue print images and rough sketches suggesting a vertical dual camera setup? 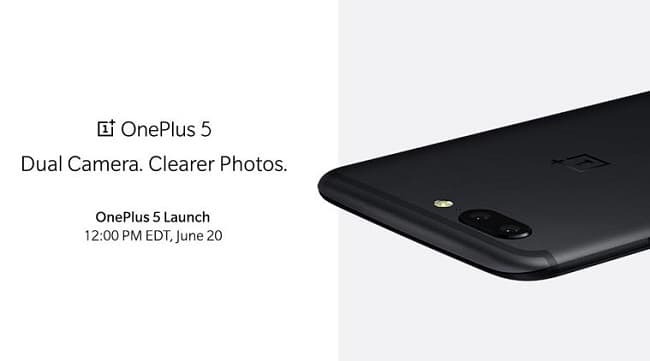 Well, around 10 days before the launch event, which is on 20th June, company decided to shut the false rumors to rest and showed a glimpse of the original OnePlus 5. As evident from the above picture, much like a today’s iPhone, dual cameras are aligned horizontally on this year’s OnePlus flagship. The image was revealed on Tuesday as a promotional teaser via Twitter post. "Dual cameras. clearer photos," is the only information, other than the image itself, that we get from the post. That clearly points toward camera being the USP of this smartphone. Although the rumors were not to the point this time, they quite accurately got the design language right. Smoother, even more curved surfaces and specially those crooked antenna band looks like a straight copy-paste maneuver from OnePlus. And there’s nothing wrong about it, iPhone does looks amazing and no one is actually stopping you from lifting few inspirations. Until and unless they keep their promise of delivering immensely powerful hardware at cheap prices in a good-looking package, I am not complaining. Coming to what else we know, OnePlus 5’s listing on Amazon India reveal a Qualcomm Snapdragon 835 SoC, 6/8GB of RAM and a camera as a result of a partnership with DXO. A report from TrueTech also gives us an insight on the starting price of the device i.e. around 32,999 Rs. For the real deal, we have to wait till 20th, but to get a hand on in India, 22nd it is.